I recently had the chance to chat with Sabrina of YesKamp, a blog dedicated to full time travel in a Toyota Dolphin! Keep reading to learn more about our most recent Toyota RV Traveler Spotlight! Sabrina says: “In 2010, we quit our jobs to travel around the world for a year. And that trip changed our entire perspective on what we wanted out of life. With the smallest budget and fewest belongings we’d ever had, we were the happiest we’d ever been. So in 2014, we decided to do it again. And it was on that trip we had the idea to buy an RV and build a semi-nomadic life. 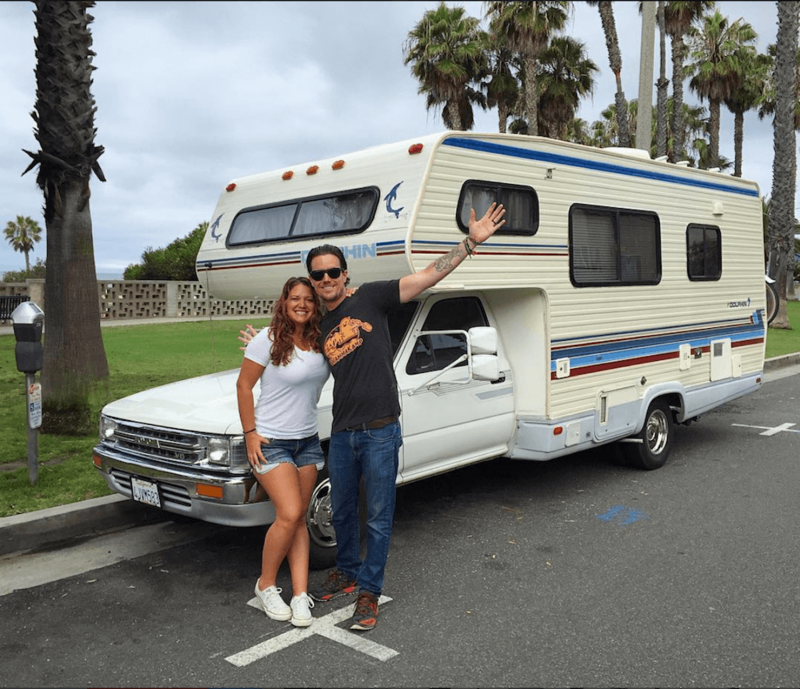 Like many other full timers, Sabrina and Reece decided to do some renovations on their Toyota Dolphin before they began traveling. This turned out to be a much bigger project than they anticipated! Sabrina’s answer to this question really resonates with me and Tom as well. Tom and I also have found that our relationship thrives while traveling. Yes, there are plenty of stressful moments, but sharing the beautiful adventures of travel ultimately brings us even closer together. What advice do they have for others who are considering camper life? Reece and Sabrina have been married for 5 years (and together for 13!). They freelance in advertising (he as an art director / she as a producer), usually in their home base of Venice Beach, CA (but are always open to travel!). You can check out their RV renovation at YesKamp.com, watch weekly DashKam antics on their YouTube page, or follow along with their adventures on Instagram @yes_kamp. Considering your own camper life adventure? Check out our ebook Nomads in Campers: A Step by Step Guide to Living your Nomadic Adventure and let us help you plan your own nomadic lifestyle! Want to read about other Toyota RV travelers? Check out our last traveler spotlight, featuring Thriving in Tie Dye! Still unsure if full time RV travel is right for you? Read these 10 Reasons to Fall in Love with Camper life. Interested in a travel experience beyond the typical RV parks? Read 5 Reasons we Avoid RV Parks and Where to Camp Instead! Did you enjoy this interview? Pin it to Pinterest!